When the thermometer drops to below freezing, there is a plant found at River Legacy that forms captivating ice structures on its body. 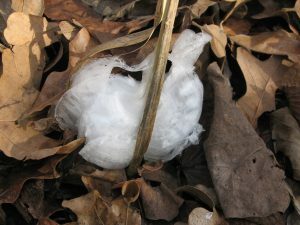 The aptly named frostweed or the white-crowned beard (Verbesina virginica) forms ribbon-like ice structures when the stem opens up during a freeze and the sap comes out of the plant frozen. This only seems to occur at the base of the plant, near the ground. These formations are sometimes also referred to as crystallofolia, meaning “leaves of crystal.” There is no evidence to suggest that the plant is permanently damaged by this phenomenon. 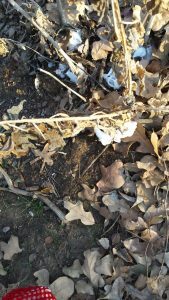 These past couple of weeks, as the area succumbed to one of the coldest winters in years, some frostweed ice “ribbons” were observed in the woods of River Legacy. Winter is not over yet. If there is another freeze, it is possible that these plants could display their ice structures once again. But, if you do miss them this winter, do not forget to come back next winter and take a walk through the tr ails at River Legacy to see them!